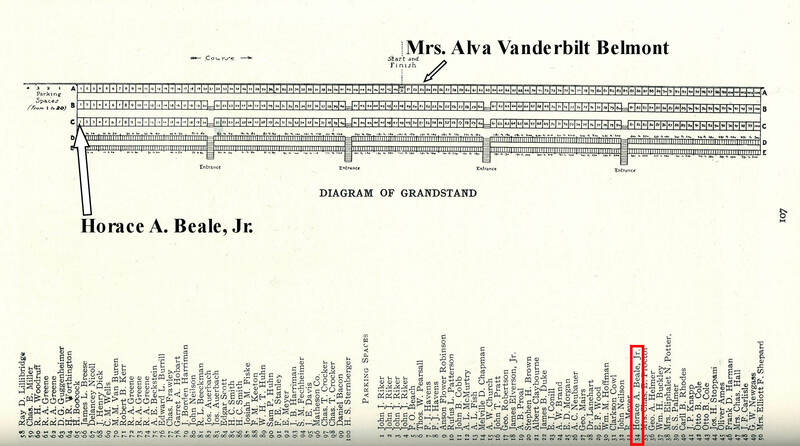 Vanderbilt Cup Races - Blog - Where in the stands is Horace A. Beale, Jr? Where in the stands is Horace A. Beale, Jr? 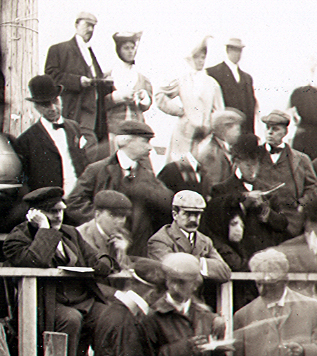 H. Binney Peale: Do you have any photos of my grandfather Horace A. Beale, Jr. at the 1905 or 1906 Vanderbilt Cup Races? 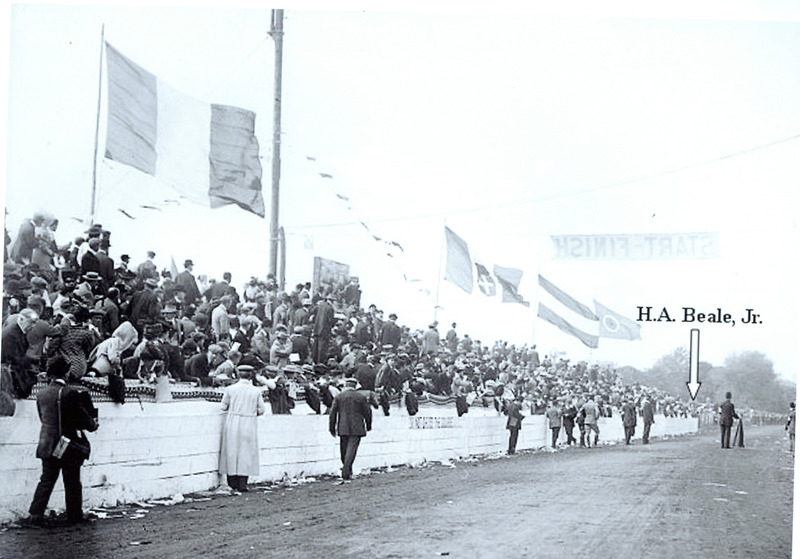 My best shot is the above photo of the 1905 race. The man in the middle with the mustache may be A.L. Riker of the Locomobile Company.Here's a close-up. 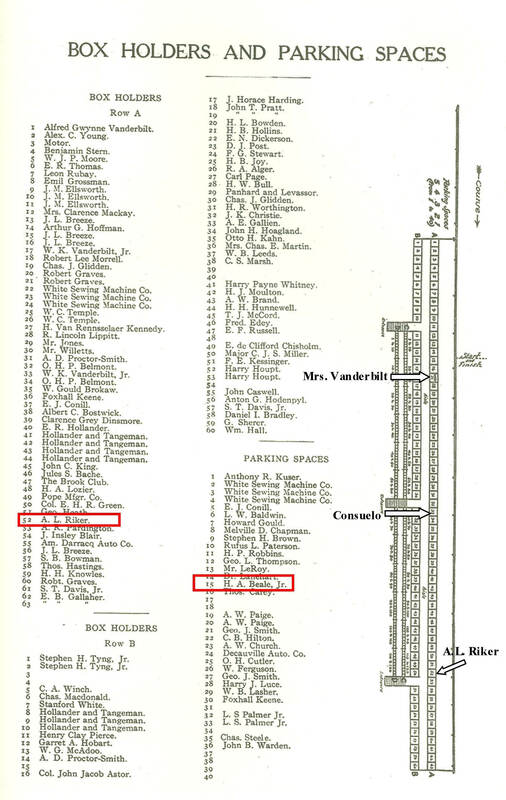 This is the box location from the 1905 Vanderbilt Cup Race Program Guide. Your grandfather is listed as having parking space #15. I have also indicated the boxes for A.L.Riker (#52), Mrs. William K. Vanderbilt, Jr (#33) and Willie K's sister Consuelo, the Duchess of Marlborough. 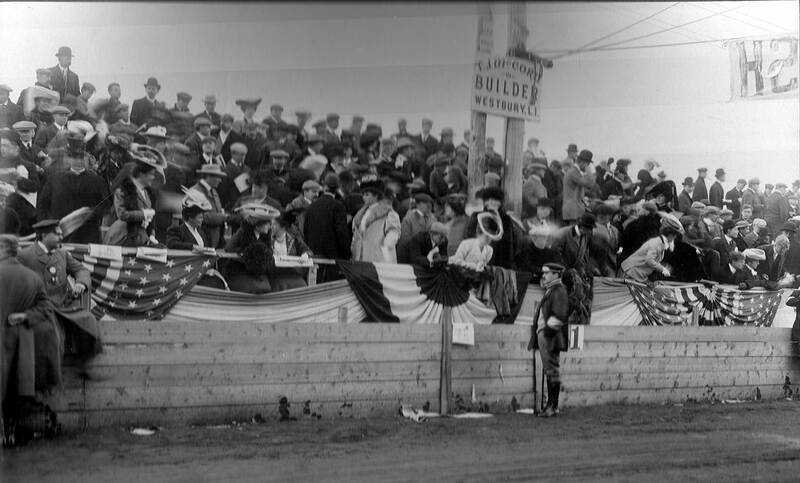 In this grandstand photo, Willie K. can ve seen speaking to his wife Virginia near the Start-Finish line. A.L. Riker's box is only 19 people to the left. Here is a close-up of William K. Vanderbilt Jr.'s sister (center wearing the white blouse). Encouraged by her mother Alva Vanderbilt, Consuelo married England's Duke of Marlborough in 1895. The 1906 Program Guide lists your grandfather's box (Row C, Seat 1) and his parking space (#34). I have indicated the location of his box in relation to Willie K's mother, Alva Vanderbilt Belmont. Based on the program guide diagram, I have marked where your grandfather's box was located. A little fuzzy, but he could be there!! 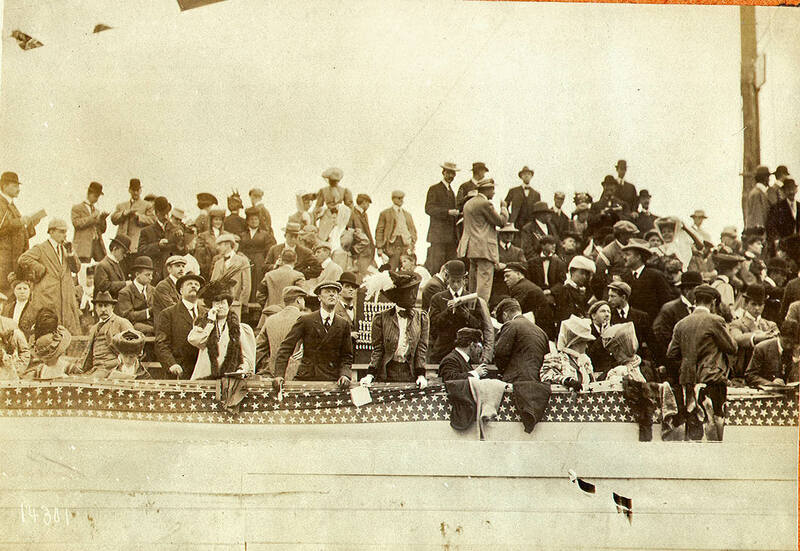 Here's another front row photo from the 1906 race. Alva Vanderbilt Belmont is standing on the left wearing a white coat. Note the vendor selling sovenirs in the middle of the photo. Here is Alva (second from left) and her second husband O.H.P. 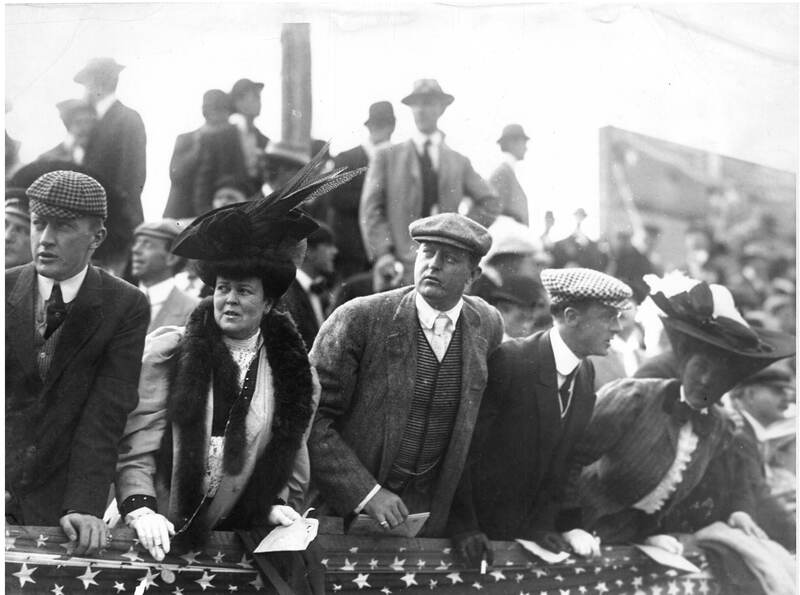 Belmont (third from the left) cheering on the racers. Binney, please let me know if he can find your grandfather visiting his friends in the front-row. He may even be in this film of the 1906 race. Good luck! Row A, Box 3 is marked “Motor”. Any clue as to what this might have referred to? And as always, thanks for the continued postings. I don’t know what that could mean.